which is dammit-Hammett antiquated. 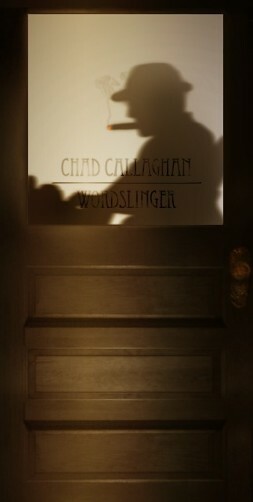 The frosted glass is etched stickered with "CHAD CALLAGHAN - WORDSLINGER". Through the window, CALLAGHAN (silhouetted, yet still handsome)can be seen. He TYPES away, a burning double corona his only companion.